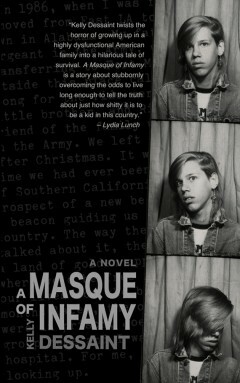 Tales of reckless youth are a dime a dozen, but the various indignities, embarrassments and hijinks in “Masque of Infamy” are presented with a fresh gloss and will surely trigger bittersweet memories among adult readers. It’s an honor to get such praise from Dean Goodman, a veteran music journalist whose book Strange Days: The Adventures of a Grumpy Rock ‘n’ Roll Journalist in Los Angeles is forthcoming from Outpost Press. Read the rest of Dean’s review on Amazon.